Led by the best player in the league, sophomore guard Kellan Grady, Davidson will remain one of the toughest teams to prepare for in the league. The Wildcats certainly have a big hole to fill with Peyton Aldridge. However, Grady, junior guard Jon Axel Gudmunsson and coach Bob McKillop’s offense will be enough to win the regular season title. Led by senior guard Otis Livingston II, not many teams in the A-10 will have the returning talent that coach Dave Paulsen has at his disposal. The Patriots return four players that averaged double figures last season. That kind of experience, depth and talent in this league separates teams. Given that this is a bit of a transitional year for the league, George Mason can do some major damage. Travis Ford is doing what most other programs in this league can’t do and that’s recruit with the big boys. Freshman forward Carte’Are Gordon is an absolute steal and leads a recruiting class that’s better than many power conference teams. He’ll be balanced by a backcourt of sophomore Jordan Goodwin and senior Javon Bess. Expect Maryland grad transfer Dion Wiley to provide depth in the backcourt as well. The Billikens have NCAA potential. Coach Phil Martelli is the dean of this league and he has another team that’ll be able to challenge for a NCAA berth. The return of sophomore forward Charlie Brown Jr. from a broken wrist gives hope to a squad that is one of the elite programs in this league. Throw in senior guard Chris Clover as well as fellow sophomore forwards Anthony Longpre and Taylor Funk and the Hawks will be a threat all year. Head coach Anthony Grant has had success at every stop and you can see it coming at Dayton. The Flyers return senior forward Josh Cunningham, who is a all-conference candidate. He’ll lead a team that also features junior guard Trey Landers, sophomore guard Jalen Crutcher, and sophomore guard Jordan Davis. The latter three will be dynamite next season, but it’s probably one year too early for NCAA tournament glory. The Rams lost head coach Danny Hurley to UConn and Jared Terrell, E.C. Mathews, Stanford Robinson to graduation. They have some stability as new coach David Cox was an assistant under Hurley. He was able to lock down the best recruiting class in Rhode Island history, which will be led by forwards Jermaine Harris and Dana Tate. Sophomore Fatts Russell and junior Jeff Dowtin are expected to do an adequate job in the backcourt in this transitional season. What Keith Dambrot has cooking at Duquesne is special. The talent on the floor is improving while the cosmetic things around the program are as well. The Dukes home court is getting a major renovation that will allow them to compete with the rest of the league. While that’s great for the future, this team will, at the very least, be competitive in the present. The backcourt of junior Mike Lewis II and sophomore Eric Williams Jr. will tough to deal with. UMass struggled a great deal last season, but has one of the best scorers in the conference in junior guard Luwane Pipkins returning. He will be surrounded by transfers Jonathan Laurent and Curtis Cobb – both of whom are expected to contribute immediately. Sophomore guard Carl Pierre and senior center Rashaan Holloway should also provide a lift. New La Salle head coach Ashley Howard comes over from Villanova where he’ll have some talent at his disposal. A deep backcourt of senior Pookie Powell, junior Isiah Deas as well as sophomores Jamir Moultie and David Beatty gives him something to work with. Moving forward, assistant coach Kenny Johnson’s involvement with the FBI probe could become a distraction for this team. The Spiders had a catastrophic start to last season, but were able to rebound to be respectable in league play. Then Khwan Fore and De’Monte Buckingham transferred. Head coach Chris Mooney was believed to be on the hot seat last season and if that was the case it’s engulfed in flames right now. Sophomores Grant Golden and Jacob Gilyard while junior Nick Sherod gives him something to work with. The Bonnies are coming off a great season that saw them upset UCLA in the First Four. It’s a good thing that they made the most of that season because it’s going to be tough sledding without Jaylen Adams, Matt Mobley and Idris Taqqee. Senior forward Courtney Stockard and LaDarien Griffin are expected to provide a big lift while freshman Osun Osunniyi, a coup for the program, while be asked to produce right away. Mike Rhoades rebuild at VCU is still ongoing as the Rams should struggle once again this season. Returning for the Rams will be juniors De’Riante Jenkins and Isaac Vann. Rice transfer Marcus Evans’ health is the x-factor for the Rams though. If he can return to his old form, it could propel them up the standings. If not, it’ll be another long winter in Richmond. Without question the toughest job in the league and it won’t be pretty this season. The difficulty in recruiting has coach Jeff Neubauer leaning on Europe to find players, which is why sophomore Ivan Raut from Montenegro and senior Prokop Slanina from the Czech Republic are the top returning players. Will be another season at the bottom of the standings for the Rams. Head coach Maurice Joseph is going to need some time to get this turned around. Four of the top five leading scorers in conference play are gone from this team while Chris Sodom, a player that was expected to add depth in the post, left before ever playing a game. Sophomore Terry Nolan is going to have a lot of responsibility and he may not be ready for it yet. Going to be a long year in Foggy Bottom. You didn’t see it coming. I didn’t see it coming. They didn’t see it coming. One team is taking the college basketball world by storm this season and it’s the Miami Hurricanes. After fighting through some early season injuries that left unfavorable results, the Hurricanes have run roughshod over the ACC. They’ve beaten both North Carolina and Duke by more than 20 at home and went to Raleigh to steal a road victory over NC State. 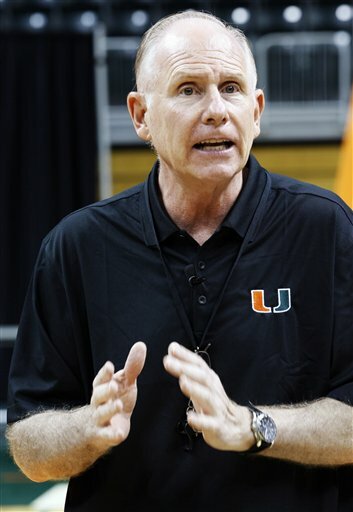 In an era of all-world freshmen, the key to Miami’s success is its age. Miami is one of the most experienced teams in the ACC and you can see it with the way its being physical with its foes. Every once a while a team pops up out of nowhere to have a special season a la Saint Josephs in 2004 and Auburn in 1999. This could be one of those seasons for the ‘Canes. Stock Up: The Atlantic 10. The additions of Butler and VCU to the conference are paying instant dividends as the quality of the A-10 rivals most power six conference. The league could legitimately send 5 or 6 teams to the Big Dance and some of those teams would be real threats to make it to the second weekend. Stock Down: Colonial Athletic Association. Yikes. What a difference a year makes. This was a league you could rely on to possibly send two teams to the NCAA tournament. Not this year. The conference champion would do well to get a No. 14 seed in the tournament. Stock Up: Louisiana Tech. The Bulldogs haven’t lost a game since December 12 and is coasting through the WAC right now. At 21-3, they’ve already dispatched Denver, New Mexico St, and Utah St, their chief rivals once and have return meetings set up. Those three games are the only thing keeping me from declaring that race completely over. Stock Down: The NCAA. Collegiate athletics is taking so many L’s these days it’s not even funny. From the way the organization handled the Myck Kabongo situation to the way it handled the Shabazz Muhammad situation, there’s no consistency and what seems to be selective enforcement. At a time where colleges are grabbing more power for themselves the NCAA needs to stop self inflicting wounds.